However, we may simply begin with focused psychotherapy. As issues arise that could be better understood and resolved with more information, I may select from among various psychological tests to aid our work. These tests are likely to clarify relevant issues that will guide us in our work together. Who May Benefit from Assessment-Informed Psychotherapy? You may be a former assessment client who wants to continue work begun during your personality or neuropsychological assessment. You may have experienced an assessment as a form of short-term psychotherapy and wish to continue with and further this work. You may wish to begin psychotherapy and leave the option open for focused or targeted personality or neuropsychological testing, as needed. You may be unsure about the use of targeted testing, but are willing to discuss the option as part of psychotherapy. Naturally, the goals and issues addressed in psychotherapy are highly individualized. I encourage you to contact me to discuss your specific needs and concerns. Animal-assisted therapy is a relatively new field. It began in the 1990s, and research validating its use has increased since the early 2000s. This approach can add a beneficial component to selected psychotherapy situations. By receiving the unconditional acceptance of the animal as a part of the therapy interaction, stress-hormones, heart rate, and blood pressure can all be lowered. 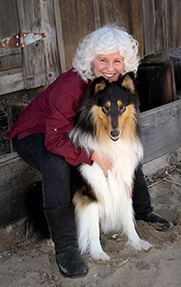 Together, Dr. Engelman and her collie, Sherpa, have worked with trainer, Marianne Dolcini, towards Sherpa’s certification in this area. Recently, Sherpa became a Good Citizen through the American Kennel Club and was certified in Canine-Assisted Therapy through Paws for Healing. Revolution doesn't have to do with smashing something; it has to do with bringing something forth.